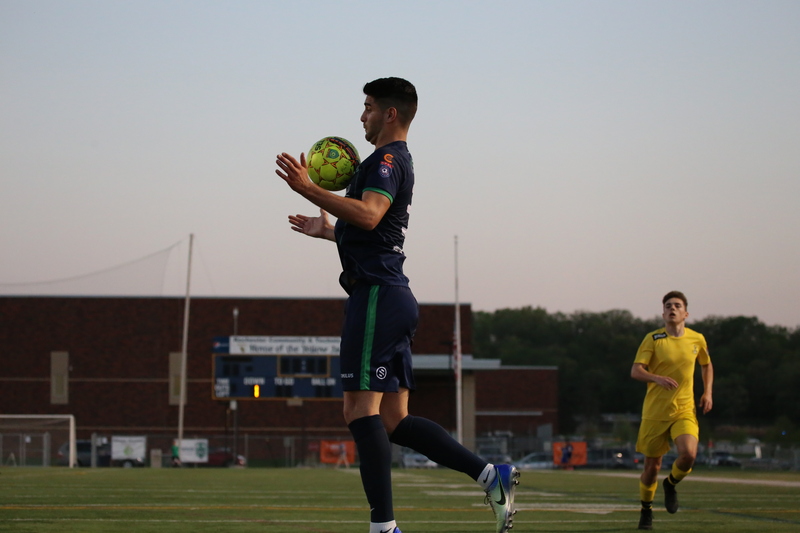 Med City FC bounced back from a 3-2 loss to Minneapolis SC over the weekend to defeat La Crosse Aris FC 5-1. Were it not for a stoppage time penalty, the Medics’ 90 minutes of mayhem would have seen them keep a comfortably earned clean sheet. At least after the first half. In the early stages, Med City was wasteful, gathering offside calls — and when not offside, often shooting wide or hitting the crossbar, as striker Claudio Repetto did. For its part, Aris was doing well to weather the storm, and even had a couple of quick breaks on counters that amounted to little, but showed that the Wisconsin team could hit on the break if Med City got sloppy. Med City FC captain Midhat Mujic challenges the keeper. Louis Livingston-Garcia photo. Once play resumed after a short 31st-minute water break, more shots went wide, and it wasn’t until stoppage time leading into the half that the scoreline changed. Nicholas Itopoulos rose to meet a corner and send the home team into the tunnel at 1-0. The second half saw less frustration as the Rochester side netted four more goals before Aris’ stoppage time consolation goal. Aris expects to struggle. Head Coach Greg Saliaras explained after the game that four players on the field were less than 18 years old, with one kid under 16 on the field. Half of his team, including four Luther College players, were still taking finals. “We still have a lot of young ones,” Saliaras said. “We started with four guys up top, all under the age of 18. It’s getting better and better, it’s just one of those things. Today we’re missing our four starters from Luther that we have usually. We’re still missing about half of the team. This year we’re going to be a little bit better. I mean, we’re still going to struggle, because we focus more on development, not so much on results. It was always going to be challenging for Aris to get some points on the road with its squad. What didn’t help was the return of Med City’s Gracious Kasheke. Gracious, the returning player, was not. Out last season with a collarbone injury before the season began, Kasheke got on the field after 14 minutes when Matias Pazos came out injured. 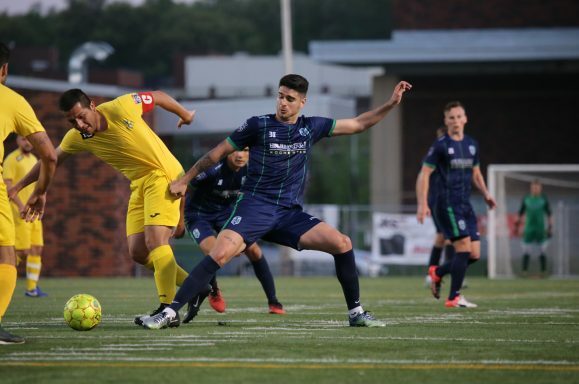 The striker was indomitable, assisting his team’s second goal, and earning a penalty kick with a series of step-overs and a confident run into the box. He proved a handful and ball of energy during his run of play. “It feels good; it took a lot of work to get back,” Kasheke said about being on the team and playing. “The biggest hurdle was the mental hurdle. I pushed through as much as I could, just stuck to it, and now I’m back and able to play with these guys — a great group this year. 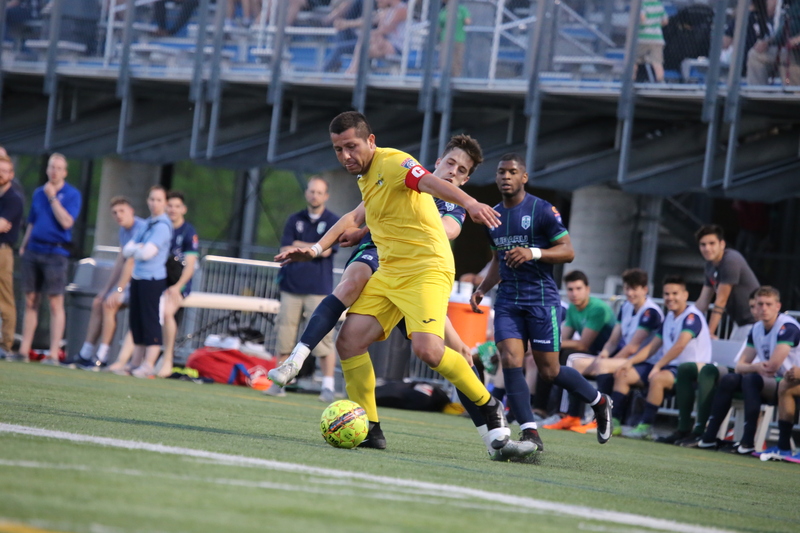 Med City striker Claudio Repetto chest traps the ball. Louis Livingston-Garcia photo. 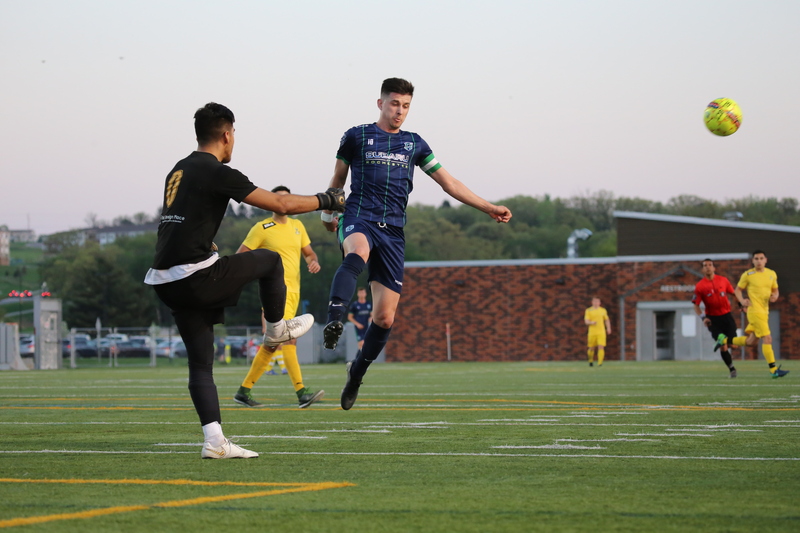 A sterner test awaits Med City Saturday when they face VSLT FC, but General Manager Frank Spaeth is positive the team is getting better, especially after losing 3-2 to Minneapolis SC over the weekend.